Since the Industrial Revolution, combustion of fossil fuels and changes in terrestial ecosystems have contributed to an increase in atmospheric carbon dioxide (CO2). However, only half of the CO2 released by human activities ends up in the atmosphere; the rest resides in a variety of carbon sinks, including the ocean. As a result, the ocean plays an important role in controlling earth's climate by serving as a significant sink for greenhouse gases, including CO2 which is continuously exchanged between the atmosphere and the ocean. Concerns about future global climate change and its consequences, including ocean acidification and global temperature increases, have pressured scientists to learn more about the ocean carbon cycle. 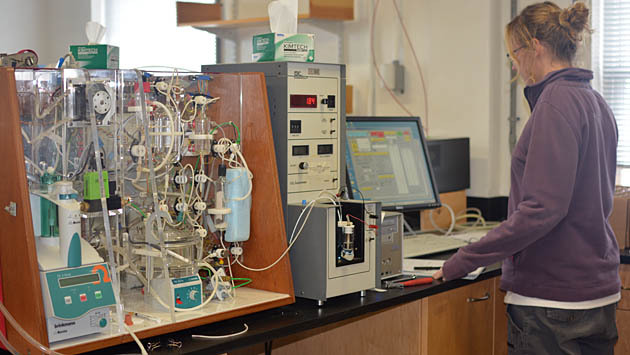 The Marine Biogeochemistry Lab at BIOS focuses on understanding the biological, physical, and chemical processes that control the ocean's carbon cycles. This includes studies on the impact of ocean acidification; physical and biological processes influencing the ocean-atmosphere gas exchange of CO2; linkages between ocean biogeochemical processes and climate variability; and the influence of coral reefs and calcifying organisms on ocean carbon cycling and the exchange of CO2 between the ocean and atmosphere. Ocean carbon measurements in support of the joint Russian-American Long-term Census of the Arctic (RUSALCA) research program in the Bering and Chukchi Seas of the Arctic Ocean.